Getting Out of Bed in the Morning by bereaved mom, author, speaker and workshop presenter, Alice J. Wisler, motivates readers who are facing grief and loss to get out of bed and face a life which, although diminished by unfathomable sadness, still holds purpose and beauty. 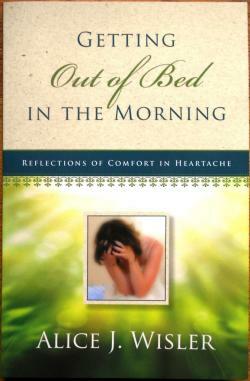 Written in devotional format, Getting Out of Bed in the Morning is a companion for those going through sorrow associated with loss--whether brought to the journey through the death of a loved one, failing health, job loss, broken relationships, or weakened family ties. Losses are real and raw; they often make people want to give up, quit trying. Yet, as readers discover how their circumstances can be used to lift hands to God, and in time reach others, they will see how God can use them to be people of encouragement and find beauty once again in a life worth living. These forty devotionals address the painful hardships realistically, as well as the doubt, worry, and fear that come with them. The pages are packed with tips on how readers should take care of themselves and draw near to God so that healing is possible. Each devotional includes reflection, prayer, and suggestions for those who want to integrate walks into their daily routine. Shipments to Canada and Europe may take from 2 to 4 weeks after we have mailed them.